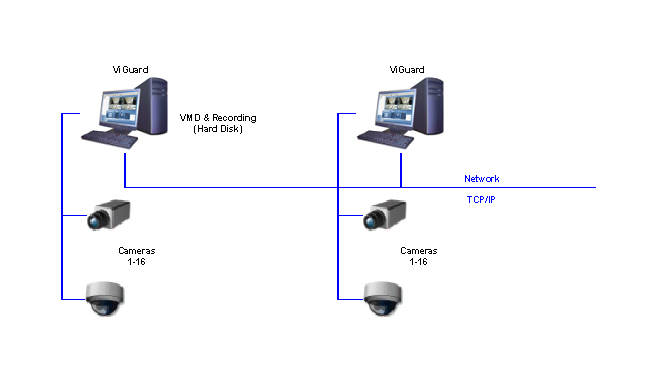 The ViGuard video software – Microsoft installation utilizes a video system configuration whereby two ViGuard units are connected to the same local network. Up to 16 cameras can be connected to each computer.The system operator can view up to 16 cameras simultaneously on each ViGuard unit. VMD can be activated for each camera and record video as a result of the VMD, or cameras can be set up to record continuously. Video can be retrieved at any time by the Video Archive utility. Viewing cameras by selecting the specific date-time range is possible and easy to use.